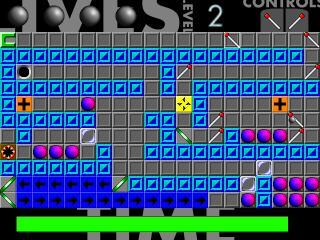 This is a remake of Balls, a 1992 Atari ST puzzle game by Electralyte Software Ltd, written for the 2004 Retro Remakes competition. The game involves placing deflectors with the mouse to guide a ball around the screen, avoiding hazards and picking up the collectables before exiting the level within the time limit. There are over 30 levels, some of which require fast reactions and some of which require a bit more thought. Nobody has shared their opinion about Balls Too yet. Be the first. Nobody has added Balls Too as a favorite game yet. Be the first. Hahaha haha hah, Balls. Whats Next? Penises?